Sharp-eyed reader M.P. spotted some changes on the University of Texas websites for the Ballads of the Lords of New Spain and the Cantares Mexicanos. Thanks to their timely alert, I’ve updated my links to the full texts and bonus materials for the two foundational collections of Aztec poetry and song. As an extra stroke of good fortune, since my original post they’ve added the Nahuatl-English Dictionary & Concordance volume that originally accompanied the print edition of the Cantares Mexicanos. Just like the main volume, it is also freely available as a downloadable PDF. Click HERE to check out the updated post! As promised earlier, I’m doing a quick writeup of basic Nahuatl pronunciation and spelling. Or rather, I found a good one online that’s consistent with what the best modern dictionaries are using. The guide below is shamelessly ripped from the Wikibooks entry that houses it, and is extended with a few notes of mine. My thanks to the authors of this guide — Ptcamn, Icelandic Hurricane, and Jguk! Go HERE to view the original entry on Wikibooks. Or go HERE to have Wikibooks render a downloadable PDF of this guide (without my notes) for you. UPDATE: … and it appears that the guys who set up the Wikibooks entry ripped it from David K. Jordan’s Nahuatl page, and extended it with their notes. The original is HERE, to give credit where it’s due. Nahuatl has four short vowels: a, e, i, and o. The vowels a, e and i sound similar to Spanish, while o can sound like either a Spanish o or a u. Unlike in English, where cuter and cutter have different vowels, the vowels of Nahuatl don’t change depending on what follows them. Nahuatl ch, m, n, p, t, and y are pronounced like English. As in English, c represents an s-sound when followed by e or i, but a k-sound elsewhere. Cu is pronounced kw, like in Spanish, or like English qu. Its inverse, uc, is the same sound at the end of a syllable. Hu is pronounced like English w. Like cu, it is reversed at the end of a syllable, so auh sounds like ow, and iuh sounds like eww. H alone, when not part of ch, hu or uh, may have represented a glottal stop, as in the Cockney pronunciation of bottle, or it may have been a sound like English h. Unlike English h, it is pronounced at the of syllables: ah isn’t simply a vowel, but a vowel followed by a consonant. Before a vowel, l is the same as English or Spanish l. Before a consonant or at the end of a word, however, it is neither dark like English l in full, nor clear like Spanish l. It is a voiceless sound, like Welsh ll. This isn’t important to understanding, though, and it can be pronounced like an English l without introducing confusion. Double ll is simply l, held longer. It isn’t a palatal sound like in Spanish, or a single l like in English. Qu is used to represent the k-sound before e and i, like in Spanish. It isn’t pronounced “kw” as in English. X is pronounced like English sh. Z is pronounced like English s.
Stress regularly falls on the second last syllable of a word. LL is pronounced like a long L (not as in Spanish). TL counts as a single consonant, never as a full syllable. U does not occur as an independent vowel. The only Nahuatl vowels are A, E, I, and O, although each of them can be long or short. CU and UC are both pronounced KW. HU and UH are both pronounced W.
The letters U and O may be used interchangeably to represent the sound of O. The letter H representing the glottal stop may or may not be written. Vowel length may or may not be marked. The consonant Y may be written with the letter I. The vowel I may be written with the letter Y. The letter Ç may be used in place of Z to represent the sound of S.
W may be used in place of HU or UH for the sound of W.
K may be used in place of QU/C for the sound of K.
I’ve added a new Links section over on the righthand side of the page, called Nahuatl Language. That section is where I’m linking material around the Net that relates to learning Nahuatl, particularly Classical Nahuatl (the language as it was a few hundred years ago). This stuff is always handy for reference, and to get your feet wet if you’re interested in learning how to read some of the primary sources that were written down in that tongue after the Conquest. 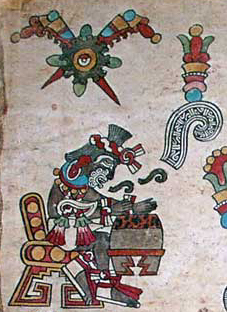 These links relate to reading Nahuatl written alphabetically, not reading the glyphs/pictographs that were used in the Codices prior to the Spanish invasion. I’m looking for material online that teaches a bit about the glyphs, though, and will link what I find. Finally, the links in there now are in a mix of languages. Molina’s classic textbook and dictionary are antique Spanish and Nahuatl; I included them for those who can read old Spanish (not me!) and due to their foundational significance in the study of the language. The html version of Renee Simeon’s 1885 dictionary is Nahuatl to French, but I would expect the numerous free online translators could handle the short snippets of relatively-recent French without much trouble. For my English-language audience, the Nahuatl Learning Environment is available in English (it’s also available in Spanish). Just log in with the ID and password noted in the link title (repeated in the tooltip if you hover your mouse cursor over it), and you’re good to go — there’s no registration or anything like that. Finally, the Freelang Nahuatl dictionary is a Nahuatl-English dictionary, and can be downloaded for offline use, or used via the web. Handy and free! I’ll do a post sometime soon on basic pronunciation to go with all these links. I’ve seen the very formal charts on pronunciation that use the technical symbols and whatnot, but frankly I can’t read them, and I don’t know many who can. If you have a copy of Frances Kartunnen’s Analytical Dictionary of Nahuatl, I find her notes on pronunciation to be the most helpful I’ve come across. Anyway, enjoy, and I’ll add more to this section as I find it.